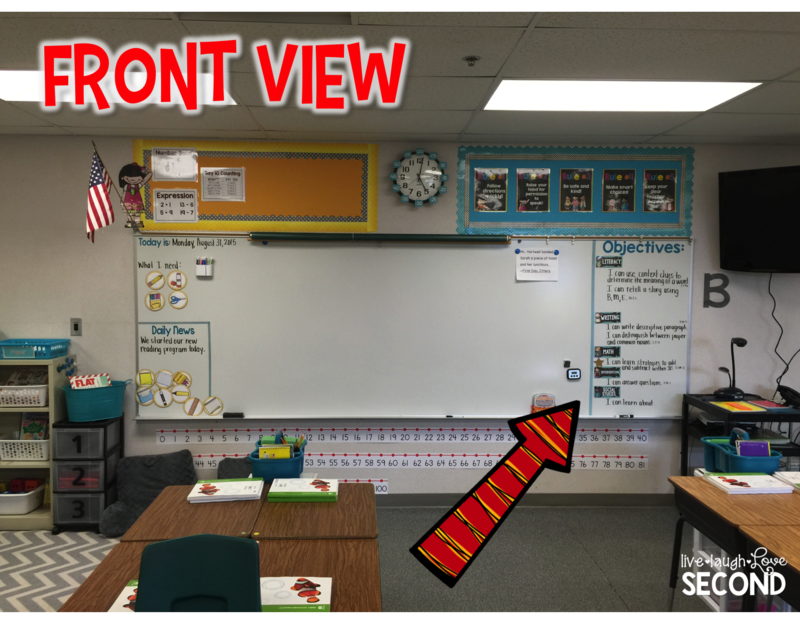 Live, Laugh, Love Second: Classroom Reveal! It's here!!! I am so excited to be joining in with Ashley at Schroeder Shenanigans in 2nd and Angie at Lucky Little Learners for their #2getherwearebetter Classroom Reveal! 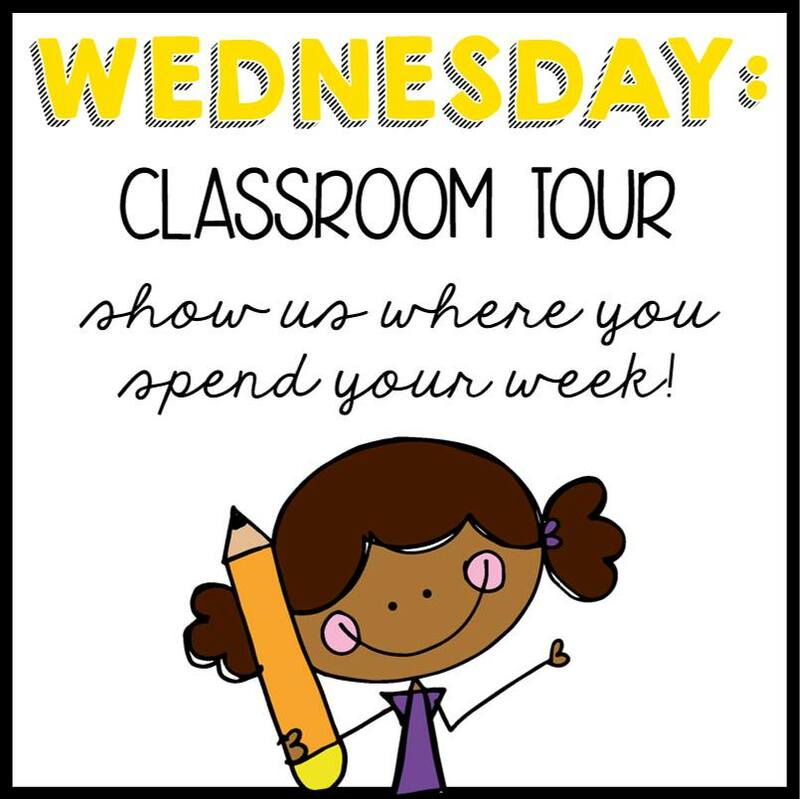 And...I also thought it would be fun to share this over at Blog Hoppin' for Teacher Week since it's Classroom Tour Day! Before we head into my room, I want to give you a bit of background into why I set it up the way I do. A couple of summers ago, i went to a Debbie Diller training in Denver. It totally changed my mindset on how I organize, how I teach, and how I set up my room. I embraced the idea of a not-so-visually-overstimulating environment with only purposeful material on the walls. I took down all the brights and went with more toned down colors like gray, teal, and a golden yellow. 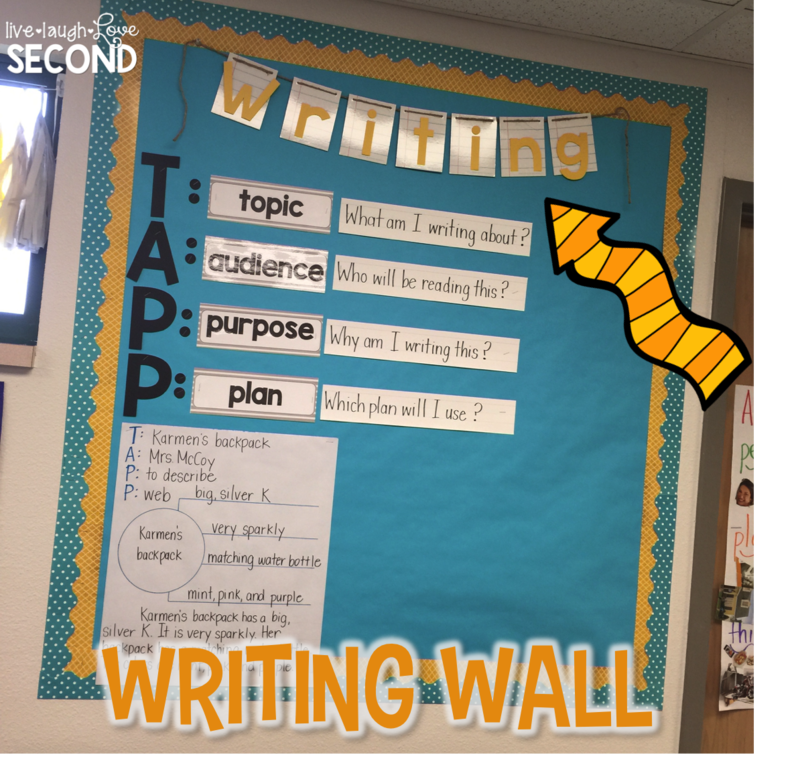 The walls are BARE at the beginning of the year. The idea is that you hang up things as you teach them. 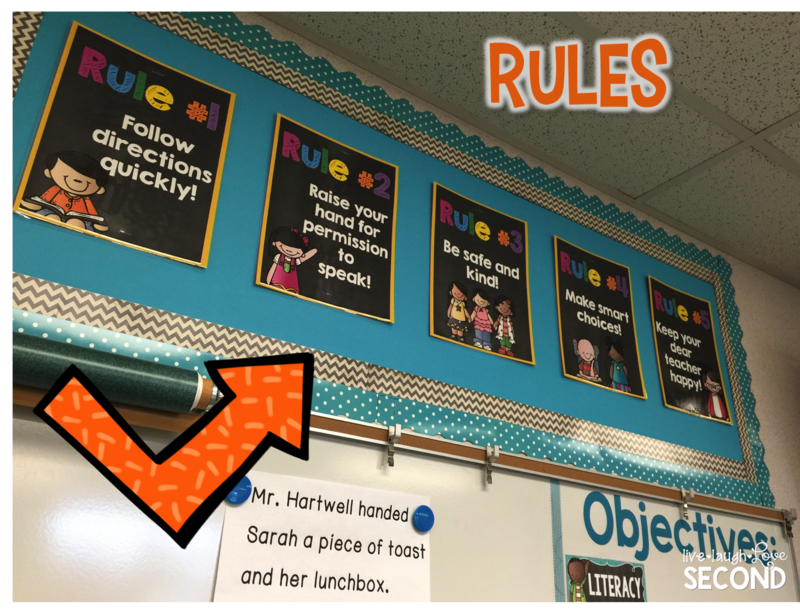 This would be my anchor charts, vocabulary, and other important content work. It just works for me. Plus my new room is TINY compared to my old classroom, so I have to be really strategic about what I hang up and where I put certain things. 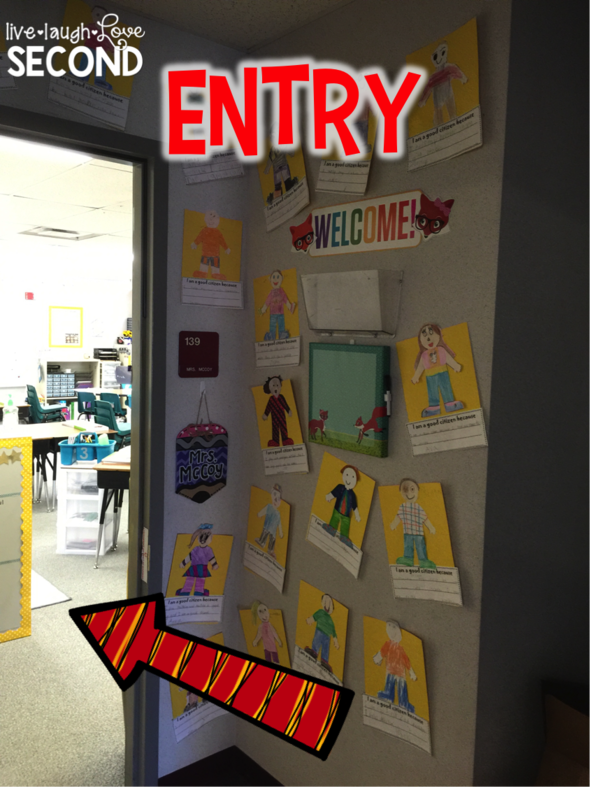 This is where I greet the kids each day with a handshake and eye-contact. I love the first-thing-in-the-morning connection. 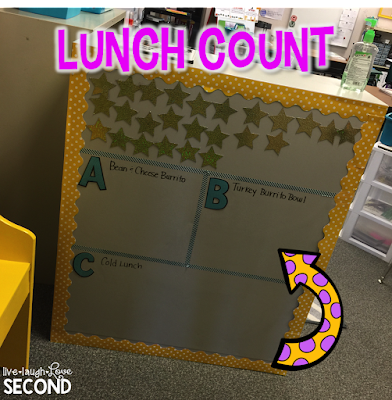 After I greet the kids, they come in and move a star to indicate which lunch they want. The stars used to have their names on them, but it took FOREVER for them to find their own names, so I erased all of them. (Tip: Did you know that you can scribble over something written in a Sharpie with an Expo marker, and it will wipe off?) 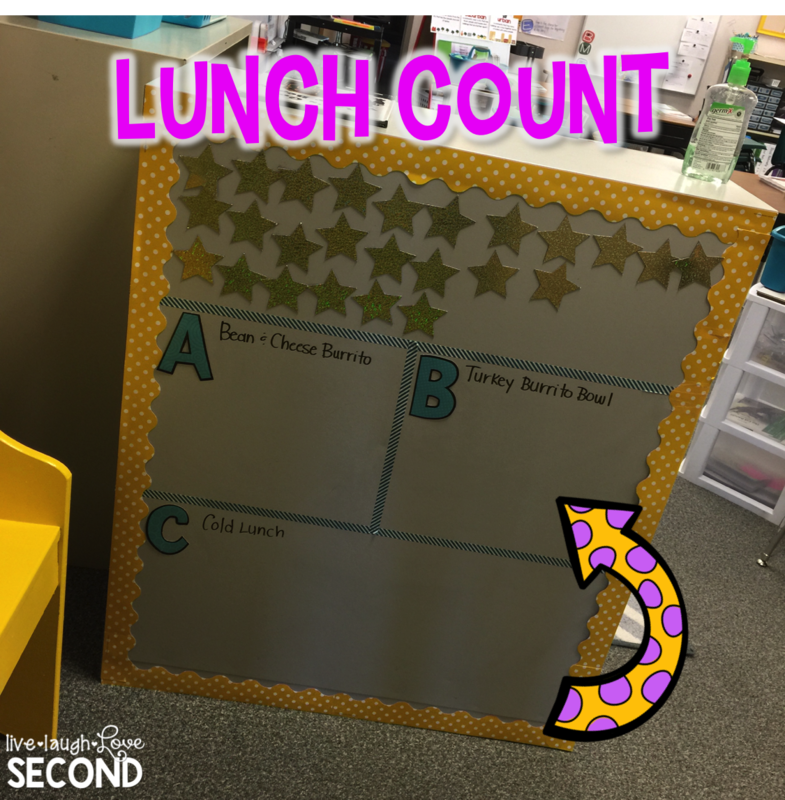 I really just needed them for the lunch count. This is looking over into the library, which I'm currently stressing over. 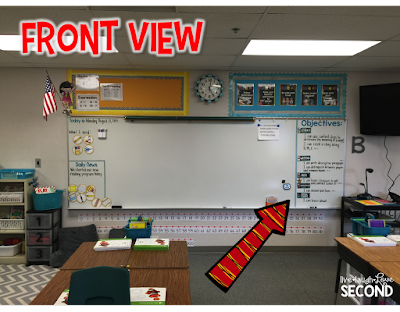 I don't like the layout, but I'm cramped for space, so the angle is necessary. The kids come in every morning and write their Daily News in their planners. They can also see what supplies they need t start the day. I made the supply cards after I had to repeat myself one too many times one day. You can check them out by clicking on the picture below. They save me so much time! Here is a closer up view of my sad library. It used to be my favorite part of the room because I had a bench, 2 totes they used as seats, and multiple pillows. Now I'm lucky to squeeze this in. 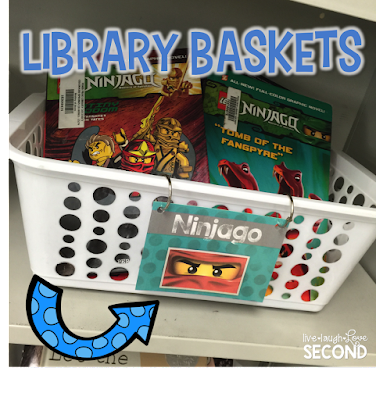 But I LOVE my library basket labels! 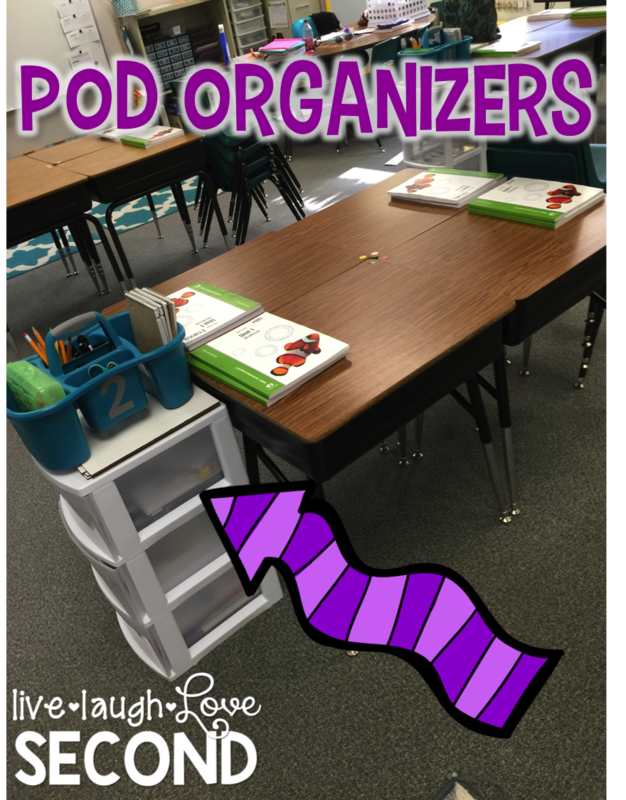 These pod organizers are a big time saver, too. 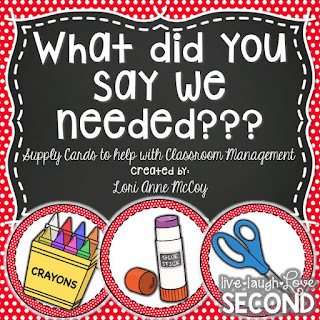 The students have personal supply boxes in their desks to use for certain things, but they mainly use the community supplies in the numbered caddies. I found them at Walmart 2 years ago. 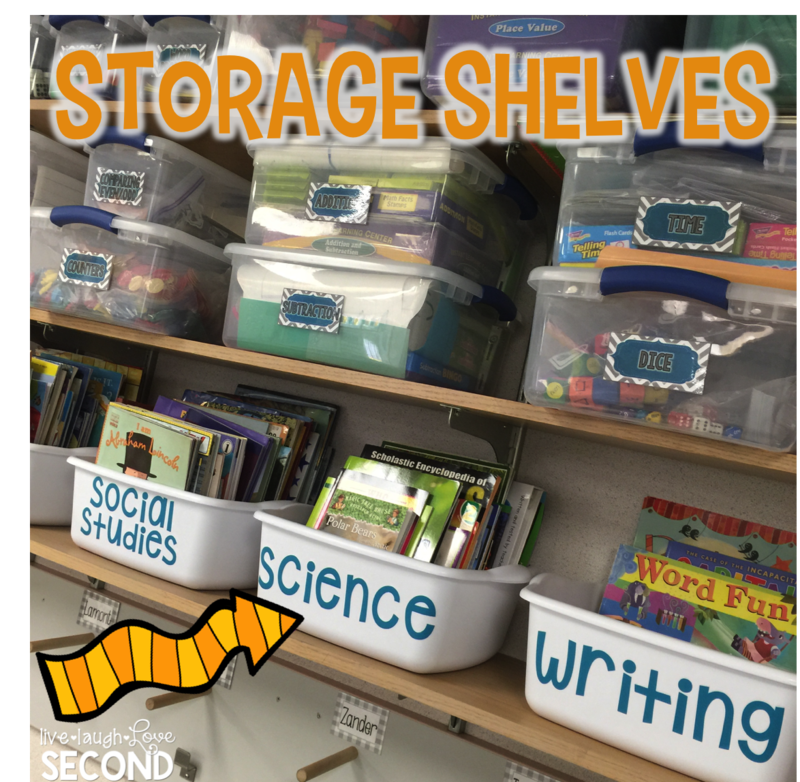 They currently hold writing notebooks, crayons, scissors, glue sticks, sticky notes, Expos, and erasers. The 3-drawer units also have a special purpose. 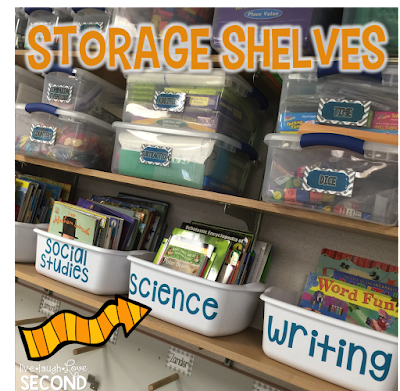 We level for math and reading intervention time, so other kids come in and out and need a place to keep their materials. 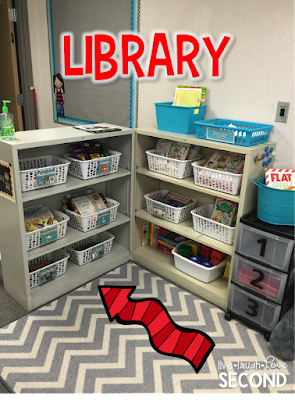 The top drawer holds math manipulatives and notebooks, and the bottom drawer holds materials for my reading comprehension group. 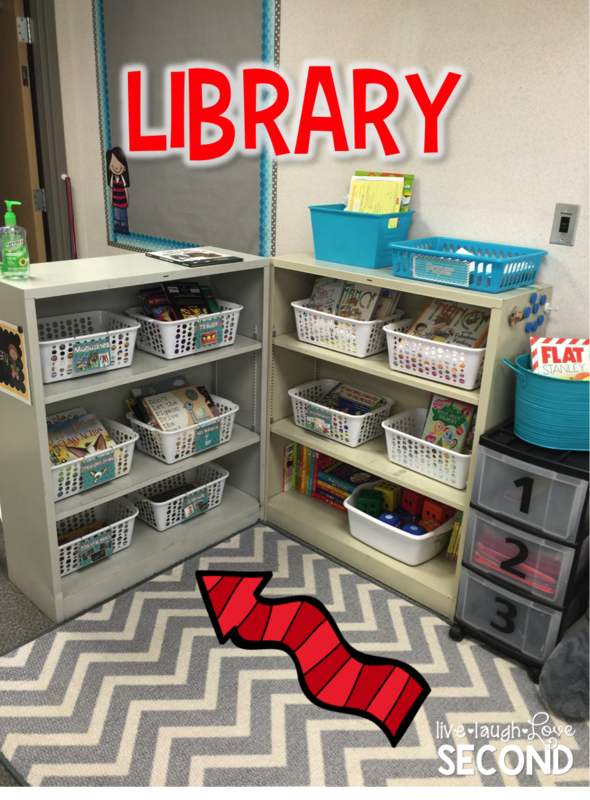 The middle drawer currently holds our readers for our new reading curriculum. 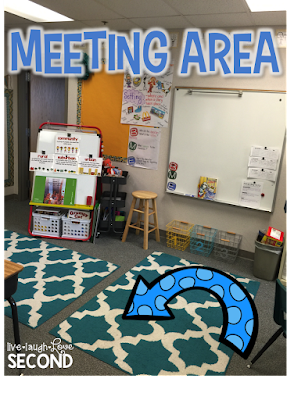 This is our meeting area. We typically begin a lot of our lessons here. 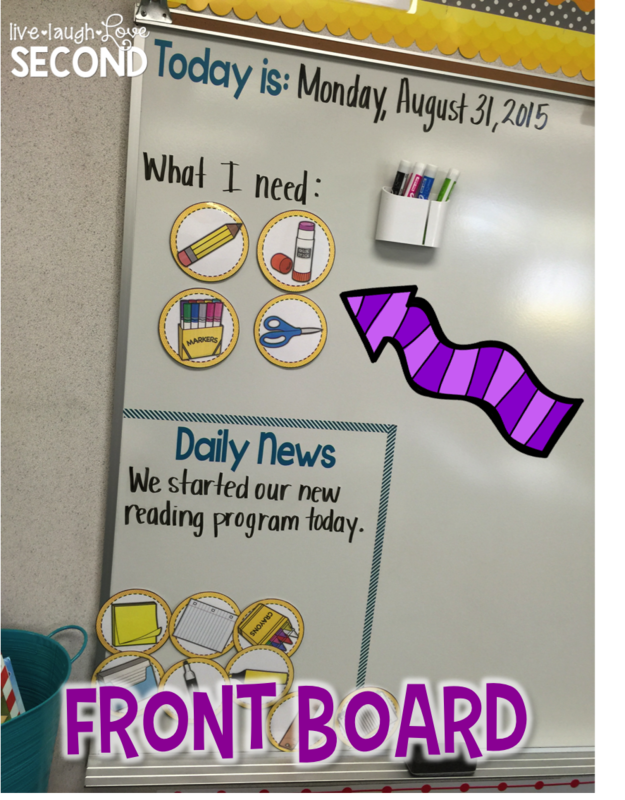 We also end our day here as we discuss our favorite things from the day and things we need to work on. It's definitely cramped space, but I value this time so much that it's worth it. As you can see, I don't have a desk. (It's a good thing, too, because I have NO IDEA where I would've put it!) I haven't had one since my first year of teaching, so I don't miss it. I usually find myself sitting at my kidney table more, and I'm forced to keep it clean since I use it so much! 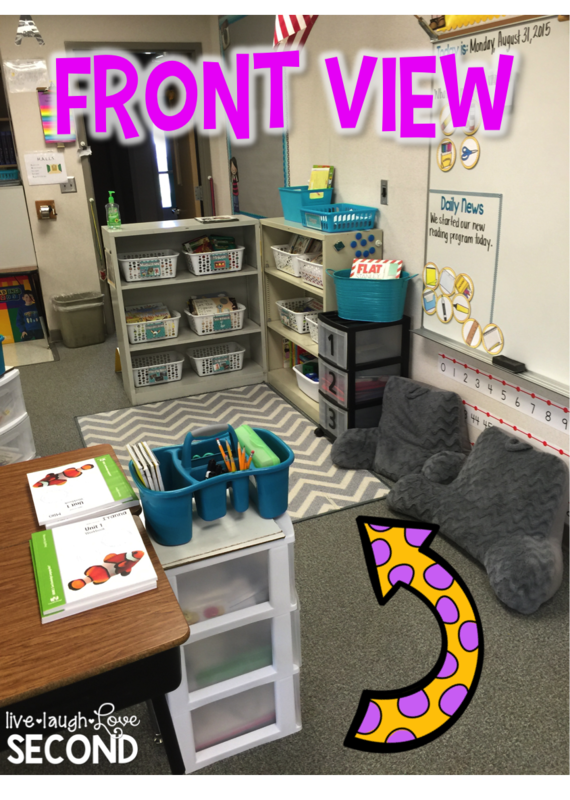 If you look really close, you can see my teacher toolbox on the shelf! The yellow frame is a cork board from Kohl's. Here are the rules. They're WBT based, and I got them as a freebie a while back from Melissa Shumway. You can get them for free by clicking HERE. I was strategic about putting them at the front of the room this year so I could constantly refer to them. It has paid off tremendously! This is the back of the room, and I use it for supply storage. 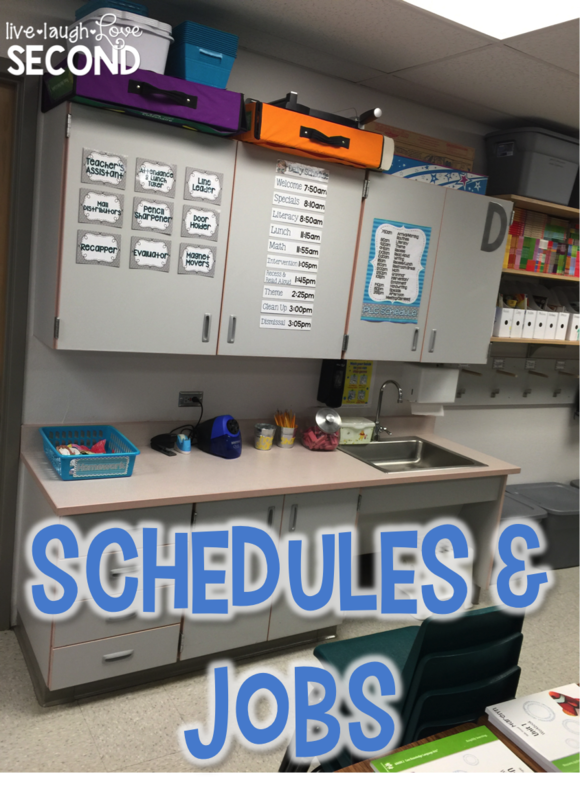 I also post our schedules and jobs. My jobs are pretty basic and are based on a book study I did this summer on Teach Like a Pirate. You can download them for free by clicking on the picture below! One thing I love about my new room is all the shelves. I love nothing more than organized materials perfectly placed on shelves. It makes my teacher heart happy! This is a close-up of the labels. They are color-coded by subject. I have a tutorial on my blog about how to make labels for your teacher tool-box, and I used that same method to make these labels. You can check out that blog post HERE. 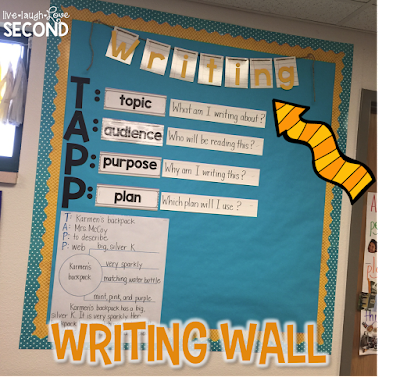 I LOVE MY WRITING WALL. For real. I could just stare at it all day. The paper pennant thing is from the Dollar Spot at Target, and I cut the letter son my Silhouette Cameo. Of course, we just started a new curriculum after 4 weeks of using this...and it's now changing. Sad-ville. 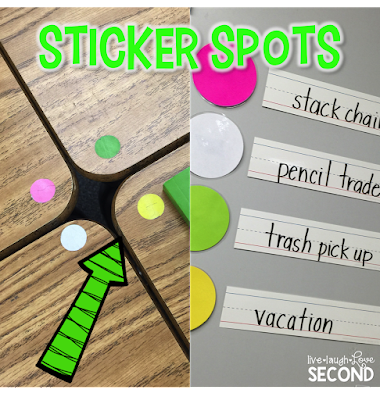 These stickers are such a life saver! 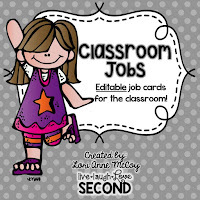 They have multiple uses: partners, reporters (for answering during group discussions), community jobs, supplies...the possibilities are seriously endless! 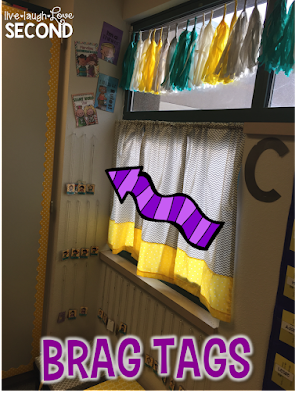 This is our brag tag area. 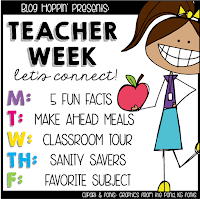 I use a mix of brag tags from Lucky Little Learners, Not So Wimpy Teacher, and Primarily Speaking. They get to wear their brag tags on Fridays, and they LOVE them. The paper tassels in the windows are from Schoolgirl Style. That big letter C serves as a multiple response strategy. 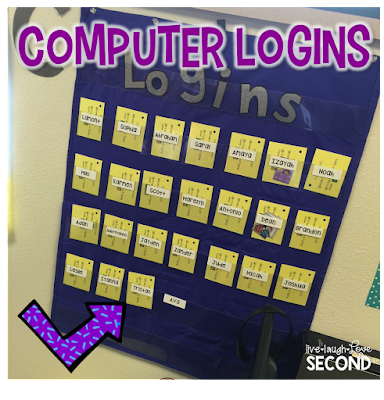 Kids will go to that spot to show their specific answer as C.
This is an old calendar pocket chart I repurposed as a computer login chart. Each student's individual login information will be housed here. It also currently serves as the newly earned brag tag holder. 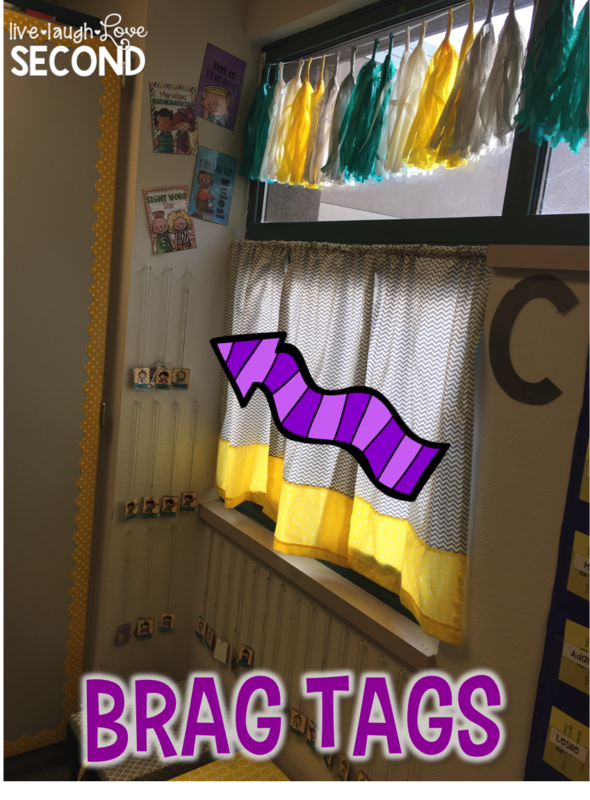 When students get their brag tags necklaces on Fridays, they stop here to see if they have any new brag tags. You can see some brag tags still in it. Whew! That was a whirlwind tour of my classroom. If I could change anything, I would figure out a different arrangement for my library, but it will work for the time being. I can't wait to check out more classrooms during these classroom reveals! Click on the buttons below to head over to both of the link ups. Have a great week!!! Your room looks terrific! 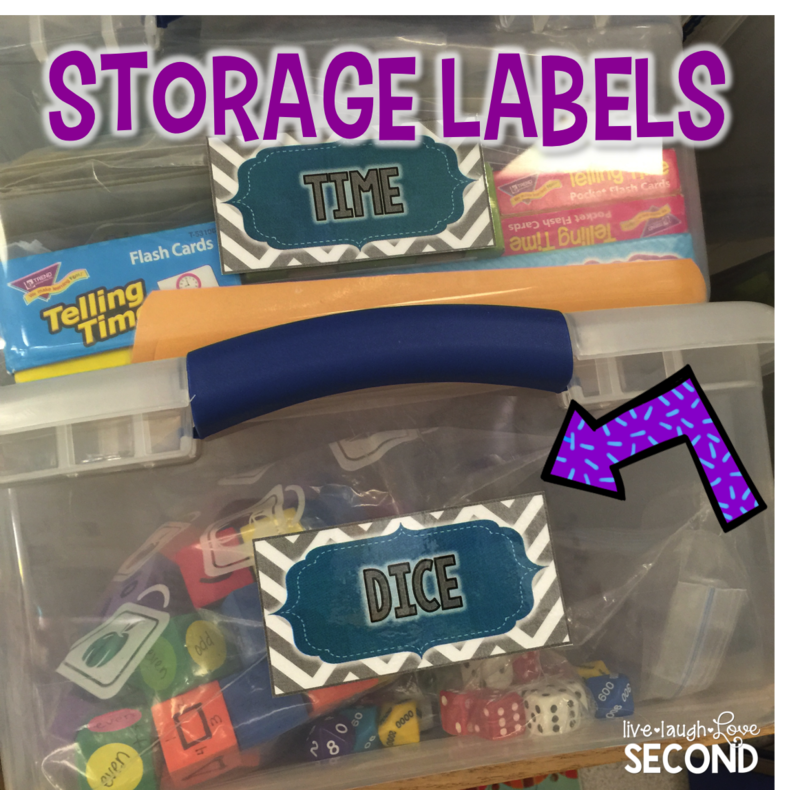 I love how you have your table supplies and boxes labeled and organized. Excellent job using a small space wisely. Your room is wonderful! I feel you on the small room thing! I moved schools this year and my new room is about half the size of my old one! Love the pod organizers too. 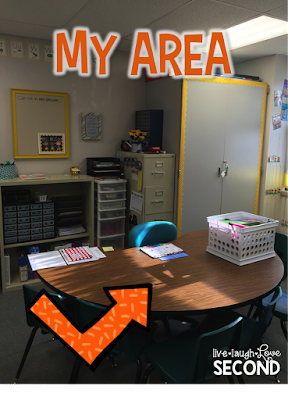 This is my first year to have desks and I added that touch to my pods too!